Statoil Selects Solberg Under New Frame Agreement | McWane, Inc.
Green Bay, Wisconsin and Bergen, Norway – In order to achieve the high environmental stewardship standards at Statoil, The Solberg Company (Solberg), the world’s foremost innovator of firefighting foam concentrates and systems hardware, has been awarded a contract by Statoil as their foam concentrate supplier under a new multi-year Frame Agreement. 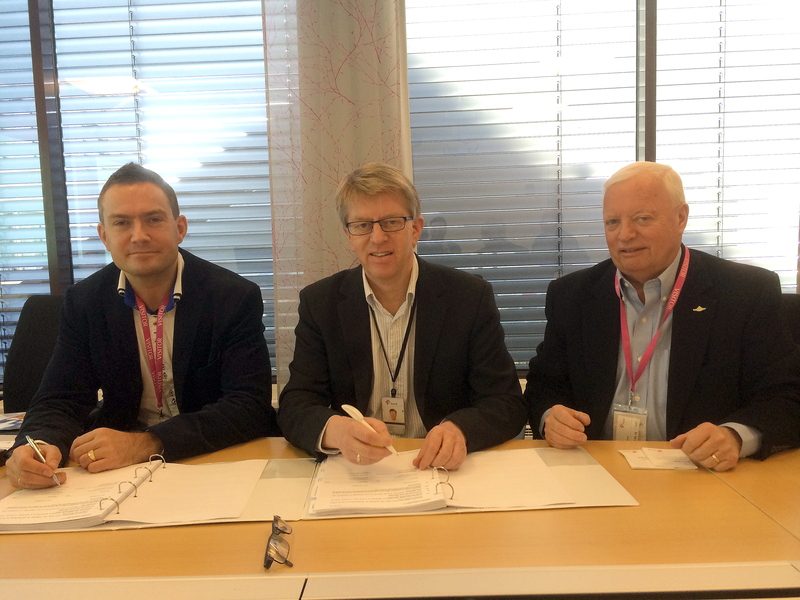 In a prior agreement, Statoil selected Solberg as their partner in the Statoil LOOP Portfolio Program to develop environment-friendly 1% firefighting foam using no fluorinated compounds or other organohalogens. In the case of the Solberg / Statoil partnership, the project developed an environment-friendly 1% high-performance firefighting foam without fluorinated compounds or other organohalogens. The result is Solberg’s RE-HEALING RF1, 1% foam concentrate suitable for use on all Statoil offshore and onshore installations. “Statoil places a very high priority on environmental stewardship, and Solberg’s new fluorine-free firefighting foam aligns perfectly with Statoil’s environmental policies” said Fredric Pettersson, Sales Director – EMEA Region for Solberg. RE-HEALING Foam concentrates from SOLBERG are an innovative environmentally sustainable fluorosurfactant and fluoropolymer-free firefighting foam used to effectively extinguish Class B hydrocarbon and polar solvent fuels with no environmental concerns for bioaccumulation or toxic breakdown. RE-HEALING Foam concentrates can be used in fresh, sea or brackish water and possess excellent fire extinguishment and burn back resistance due to its flow and rapid sealing characteristics. The product takes its name from the foams physical “resealing” characteristics. The first platform selected for retrofit with R-HEALING RF1 foam concentrate was Kvitebjørn. The Kvitebjørn gas and condensate producing installation lies in block 34/11, east of Gullfaks in the North Sea in the North East Atlantic. It has been developed with a fully-integrated fixed steel platform with drilling and processes facilities and living quarters. The second platform selected Njord A located further north in the Norwegian Sea. On the new oil platform “Gudrun,” Aqueous Film Forming Foam (AFFF) was never an option and RE-HEALING RF1 has been used from day one. Based in Green Bay, Wisconsin with operations in Bergen, Norway and Sydney, Australia, Solberg has been involved with the manufacture of firefighting foams since the mid-1970s. Solberg is recognized throughout Europe and the Asia Pacific Region for its environmentally sustainable fluorosurfactant and fluoropolymer-free products that are an innovation in Class B firefighting foam. Additionally, Solberg manufactures a complete range of traditional foam concentrates, Class A and High-Expansion foam concentrates including foam systems hardware. Solberg’s unique technology is preferred by customers in the aviation, chemical, energy, fire services, oil and gas, petrochemical, pharmaceutical, solvent & coatings markets. Posted on April 3, 2014, in Company Advances. Bookmark the permalink. Comments Off on Statoil Selects Solberg Under New Frame Agreement.